Ajax serves as the dramatic centerpiece for Theater of War, an acclaimed troupe who stage readings of the play to elicit discussion and activism on behalf of struggling veterans. If you have a chance to see a Theater of War performance, by all means do so. They also perform readings of another Sophocles play, Philoctetes, which like Ajax portrays the aftermath of war on a soldier wounded physically and emotionally by his experiences. Philosopher Nancy Sherman uses Philoctetes as the literary lens through which she explores issues of moral injury and repair in her recent work The Untold War. I’m fine with all this Greek love, but it does make me appreciate all the more Brian Turner’s persistent effort to seed his poetry with references to Iraqi, Arabic, and Mesopotamian classic literature, folklore, and history. For my part, I turned first to ancient Rome when crafting the following short tale called “Cy and Ali.” It’s based on “Ceyx and Alceone,” a tale from Ovid’s Metamorphoses, a collection that itself draws on Greek antecedents for subjects, themes, and inspiration. Read on if you care to. Cy busied himself with the by–now routine activities of a combat patrol: gathering his personal gear and stowing it in the truck, drawing the big .50 caliber machine gun and mounting it in the gun turret, setting the frequencies and security codes on the radio, helping out the other crew members and being helped by them in turn. As he waited for the mission commander to give the patrol brief, he thought about his wife for a few moments. Ali had not wanted him to go on this deployment; he had had options that would have kept him in the States, at least for a while longer, and she could not understand why he had been so eager to return to Afghanistan. “I think you are crazy,” she had told him. Left unstated was the suspicion that he liked the idea of going to war more than he liked the idea of being with her. She loved him dearly, and though he professed his love for her, too, she couldn’t help but feel that he didn’t value their relationship as much as she did. Cy also wasn’t sure what to think, either then or now while he waited for the patrol brief to begin. Returning to Afghanistan had been very important to him, but beyond his claims about needing to be with his unit and doing his duty, he sensed that there was a cold hard nugget of selfishness about his willingness to jeopardize his marriage—not to mention his life—for the sake of the deployment. The offer seemed lame, even to Cy, like he had thought about it for two seconds, but Ali acceded to it anyway. She loved Cy in part because he was a soldier, but some things about being a military wife were really bad. Now she busied herself with her own classes, her part-time job, and her friends and family. But she worried a lot, and had a premonition that things might not end well. The day’s mission was nothing special: accompany an Afghan army unit while they resupplied three of their outlying outposts. The mission commander explained that the Americans’ role was to inspect the readiness of the Afghan outposts, and to provide artillery and medical support in case anything happened along the way. Cy’s job was gunner on the mission commander’s truck, which was to be third in the order of march behind two Afghan trucks. From the truck’s exposed turret he was to man the .50 cal while keeping an eye out for suicide bombers, IEDs, and ambushes. But nothing was expected to happen; “There has been no enemy activity on the planned route in the last 48 hours,” the mission commander informed them. They had traveled the day’s route many times before with nothing more serious occurring than a vehicle breakdown. Sure they planned well and rehearsed diligently, but that was all the more reason the actual mission was probably going to be not much. Which is why what happened, at least at first, had an unreal feel. Three miles out, on Route Missouri, Cy saw the two lead Afghan trucks come to abrupt halts and their occupants pile out. The Afghan soldiers took up firing positions on the right side of the road and pointed their weapons back to the left side. Because he had headphones on and was chattering with the other truck occupants, Cy was unable to immediately distinguish the sound of gunshots, and it took him a moment to comprehend that the Afghans had stumbled into an ambush. Other Americans also soon gleaned what was going on and suddenly the intercom crackled with questions, reports, and commands. Cy identified three turbaned gunmen firing at the Afghan army trucks from behind a low wall. He charged his machine gun and began to shoot. He had fired the .50 cal dozens of times in training and thus was surprised by how far off target were his first two bursts. But very quickly he found the range, and was rewarded by seeing the big .50 caliber rounds chew up the wall behind which the insurgents were hiding. Dust and debris filled the air; Cy couldn’t tell if he had hit anyone, but surely the fire was effectively suppressing the enemy. By now, the other American trucks had identified the gunmen and were firing, too. Still, it was so hard to figure out exactly what was happening. 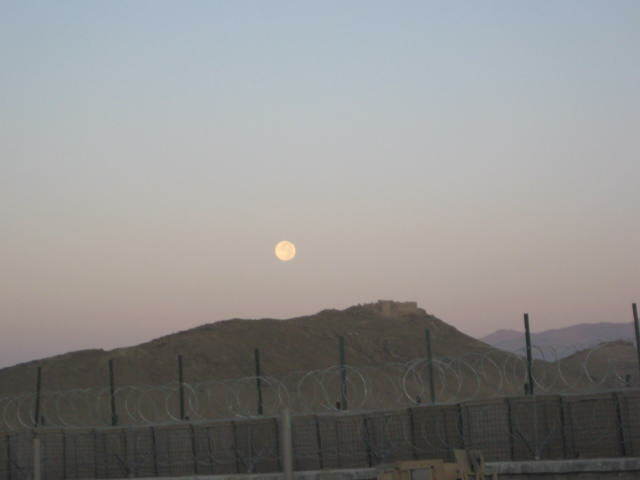 That the three insurgents behind the wall were capable of resisting the torrent of fire unleashed on them by the American and Afghan soldiers seemed impossible, but no one could tell if there were other enemy shooting at them from somewhere else. Soon, however, the sound of explosions began to fill the air. Again, it was not immediately clear that the Afghan army soldiers and the insurgents were now firing Rocket Propelled Grenades at each other. “What’s going on up there?” Cy heard the mission commander ask him through the intercom. Loud booms resounded everywhere from the impact of the rocket-fired grenades. Cy next heard “RPG! RPG!” echo through the intercom as the Americans understood that they too were now under attack. A round exploded against the truck to his left and Cy felt the blast wave wash over him. How could the enemy engage them so accurately? As the battle unfolded, Cy realized the situation was serious, no joke. The rest of the crew was protected inside the armored truck, but he was partially exposed in the machine gun turret. He continued to fire the .50 cal, doing his best to punish the insurgents who were trying to kill them. The noise was deafening, but in the midst of the roar of his own weapon and the other American guns, as well as the cacophony of human voices on the intercom, he discerned that enemy fire was pinging around him and sizzling overhead. Though he was not scared, he thought about his wife. Ali had felt uneasy throughout the day. She had not been able to communicate with Cy, which in itself was not so unusual. She understood that sometimes missions made it impossible for him to call or write. Still, she sent him emails and texts and the lack of a response for some reason felt ominous. That night, she had had a terrible dream. Cy appeared, looming over her, silent and reproachful, and Ali had awoken with a start. Nothing like this had ever happened before, not even close. She didn’t know what to do, so she watched TV for a while and then began surfing the Internet. She thought about calling her husband’s unit rear-detachment commander, but decided not to. There was no one she could talk to who wouldn’t think she was overreacting, so she didn’t do anything except continue to worry. The next morning two officers appeared at Ali’s door. “The Secretary of Defense regrets to inform you that your husband has died as a result of enemy fire in eastern Afghanistan,” one of them intoned. It was all too true, but for Ali the reality of the situation dissolved in a swirl of chaotic thoughts and physical sickness. Ali waited on the tarmac at Dover Air Force Base with Cy’s parents. An honor guard was also present, as well as a contingent from her husband’s unit, and a general whom she had never seen before and whose name she didn’t catch. Everyone was very nice to her, but Ali was confused. She didn’t know if she was supposed to be strong and dignified or to collapse in a pool of tears. She also didn’t know if she was angry with her husband, angry toward the Army, or just some strange combination of sad and proud. As her husband’s casket emerged from the plane, Ali felt herself drawn toward it. First she was taking small tentative steps, as if she were nervous about breaking some kind of rule or protocol. Then she was running, moving quickly toward the casket while the others in attendance waited behind. She was barely aware of what she was doing, but her feet seemed to no longer be touching the ground. It was as if she were floating or flying, and her arms were beating like wings of a giant bird. “O, Cy, is this the homecoming you promised me?” she thought, or maybe said aloud. Then she remembered throwing her arms around the casket, but at the same time she also felt herself rising into the air, in unison with her husband, who now was alive again and also seemed a magnificent, noble bird. Together, Cy and Ali soared upward, and the plane and the honor guard and the onlookers whirled beneath them as they circled in the sky. This entry was posted on November 16, 2013 at 5:09 pm and is filed under Art and War. You can subscribe via RSS 2.0 feed to this post's comments. Thanks, Peter. Lots of reality in this fiction. My own favorite part is the ambush scene, where the headphones intended to facilitate communication actually impede Cy’s perception of the battlefield and situational awareness. The less-tricked-out Afghans seem to be more aware. Reads like it was written by someone who has been ambushed. Was Ovid ever shipwrecked? Well done. Drop 50 and fire for effect. Well, holy hell, I came here looking for a review of ‘Sparta’ (which one of the mil spouses is reviewing, so I wanted to see what you’d said about it) and just got socked in the gut by an adaptation of a myth. I love your story! I certainly can’t attest to the reality of the ambush details, but the husband-and-wife complexities seemed real to me. There’s a certain poignancy to wishing you could be with your significant other in those worst moments. It almost seems like the cruelest divider people face — that someday, someone you love is going to go through something awful and you won’t be there, and you won’t know until it is over. Kind of the common mil spouse nightmare, and you wrote it up perfectly. Thank you thank you, Andria, but the real thanks go to the ancient myth-makers–I followed the original as scrupulously as I could.